Basic math facts can be of two types; the addition facts and the multiplication facts. Addition facts use addition and subtraction, while multiplication facts use multiplication and division. We encourage kids to learn and use the both kinds of math facts when they multiply or divide numbers. Basic math facts can be of two types; the addition facts and the multiplication facts. Addition facts use addition and subtraction, while multiplication facts use multiplication and division. We encourage kids to learn and use the both kinds of math facts. 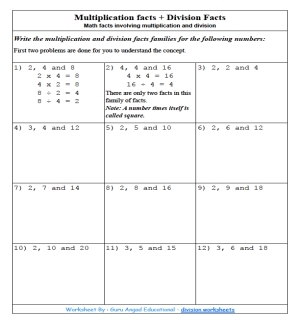 Math facts worksheets are given in this site as an aid to division worksheets. So, must visit the math fact page of the site. 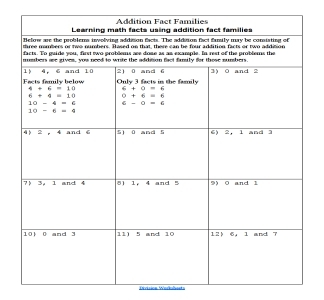 Let's talk about the addition facts and families, first. Very easy to understand, once kids know the basic addition and subtraction, then they can learn addition and subtractions facts easily. The order of learning division may be; to learn math facts, then basic division using basic division lessons and worksheets, then to learn the long division. Hence, the math facts are the first step towards learning division. Therefore, on this page we will explore the math facts. You can find key lessons and examples followed by the math facts worksheets on this page. Let's start with addition and subtraction math facts first. As said earlier, if kids know how to add or subtract, they can find the addition and subtract facts easily. We put all the facts in a fact family. For example; consider numbers 3, 5 and 8 we can attach these numbers using the addition facts. Above is the addition fact family of numbers 3, 5 and 8. In the above family, the top 2 facts are known as addition facts and bottom two facts are called the subtraction facts. Wish all the kids a good luck in their studies and lives!